A huge thank you to this episode’s sponsor: Craneway Craft Fair. I first learned about Craneway Craft Fair when I moved to the Bay and was searching out craft fairs to attend (as you do). This year is the 48th annual Craneway (formerly known as the KPFA Crafts Fair), and it’s happening on December 22 & 23rd. This last week especially I’ve been reflecting on how important handmade and locally made is to me - especially in light of the wildness of consumer culture in america & Craneway feels like the total antithesis to all of that. From 10am-5pm on Dec 22 & 23, so just in the nick of time if you have any last minute holiday gifts in mind, you can find artisan made goods in the Craneway Pavillion in Richmond, CA. The best part is, Craneway directly supports Berkeley’s KPFA 94.1 public radio. KPFA was the first community supported radio station in the USA. They currently air public news, public affairs, talk, and music programming & they’ll be broadcasting live from Craneway on the fair days! It feels pretty awesome to be shouting out an organization that’s supporting not only local makers but also progressive public radio. You can find Craneway on instagram at @cranewaycraftfair and online at cranewaycraftfair.com See you on the 22nd! This week I spoke to Aaron Sanders Head. Aaron’s work stood out to me this year when I first noticed his sashiko-informed stitching and really stunning imagery. Aaron walks me through his career from post-college to now, and how fiber art has kind of (excuse the pun) woven it’s way into his life - throughout his career in arts administration. 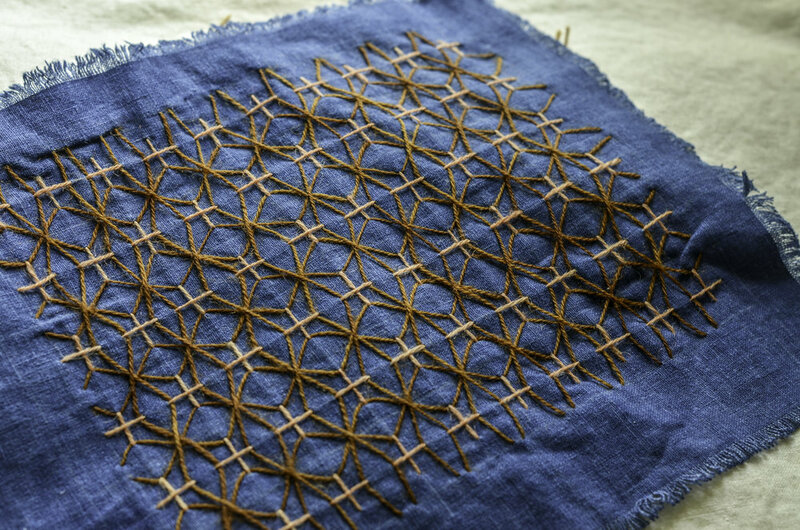 In his work with a local art gallery, he began booking workshops to accompany exhibitions & soon realized he was booking the types of classes he was interested in - quilting, embroidery, sashiko, natural dyeing. It was from here that he really began an active and daily practice. Aaron was remarkably candid with me - we talk about finances, the difficulty and importance of sourcing materials thoughtfully, and the privilege in being able to “slow down”, and how the term ‘self-care’ has been sometimes misused. I appreciated Aaron’s grounded perspective on so many topics and it was really refreshing to hear them articulated in this way! This chat really takes you on the journey with Aaron, I feel. 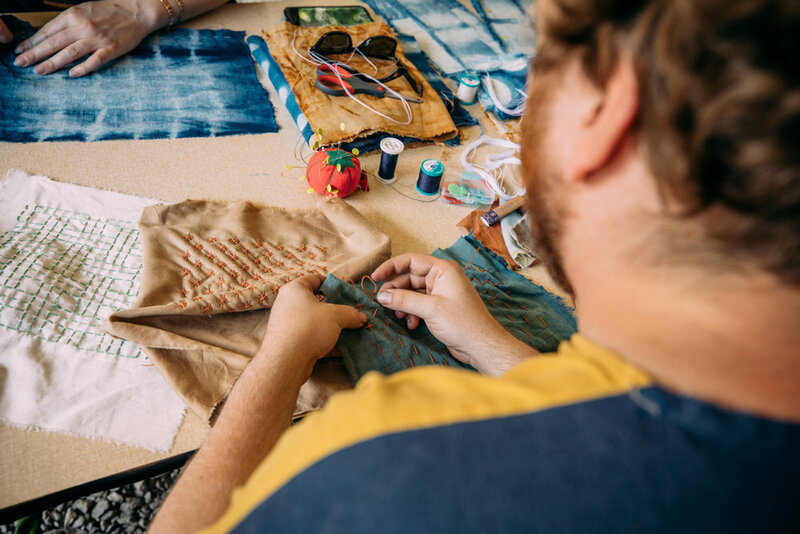 So listen on to hear how Aaron went from studying photography in Boston, to touring Texas with his partner, teaching indigo dye workshops and making it work. The Close Knit Podcast is supported by the following people (& more!) through Patreon. If you'd like to support the podcast and get access to sneak peeks + additional content for patrons-only, please check out patreon! Aleksandra Alex Alicia Alison C Alison S Amanda Bee Belle Brittany Caitlin Carolina Carolyn Casey Cath Catherine Chantale Chase Elizabeth Ellen Emily B Emily P Emily T Hanna Lisa Heather James Justice Laura Lauren Lawral leah Lyle Marta Morgan Natalie Natasha Niki Ocean Rachel Sandy Sarah B Sarah H Shelby Shelly shivani - THANK YOU SO MUCH! Lowe Mill - formerly a textile mill, now the largest privately funded art center in the US, where Aaron worked & where he was given a studio space as part of his job. Fiber Farm - naturally dyed wool thread, where Aaron sources his thread!